Are any of you fans of the Cast On podcast? It's a knitting podcast, but you don't have to knit (much) to enjoy it. There is a new episode available now, the podcast was on hiatus over most of the summer. Audrie has been working on some beautiful projects lately. I love her new tablerunner. Craft Hope is collecting quilts made of squares for homeless children in Grand Rapids, Michigan. Jennifer from CraftSanity has an awesome interview podcast and is selling wooden potholder looms--I love these! 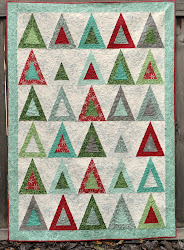 And, not quilt or craft related, but check out this cool little laundry post at Blog Segullah. I might need to print it out for my laundry room, too. And count my blessins. And umm, I hate to say it but I actually like doing the laundry lol It's a sickness, I know.